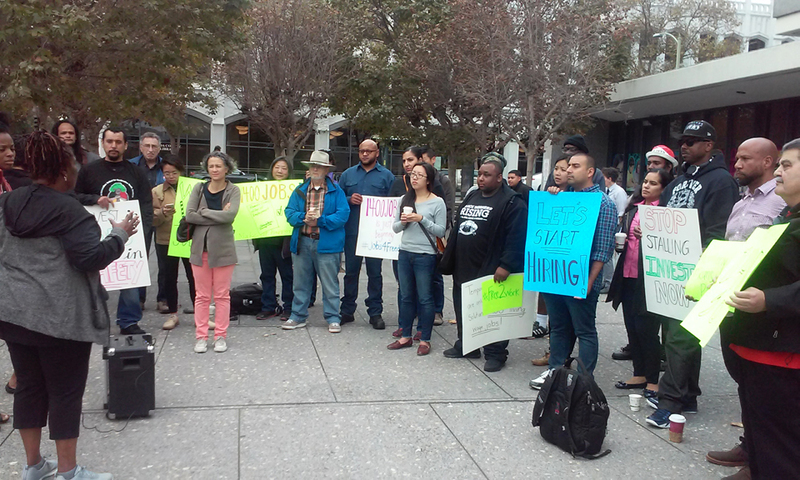 Oakland – On Oct. 11, the Justice Reinvestment Coalition of Alameda County, a network of leading social justice organizations in the Bay Area, held a march and rally calling on Alameda County to fulfill its promise to provide jobs for formerly incarcerated people. In June 2016, the Alameda County Board of Supervisors voted unanimously (5-0) in favor of a new Re-Entry Hiring Program that aims to provide 1,400 county jobs for people impacted by the criminal justice system and youth in the school-to-prison pipeline in Alameda County. The vote on this groundbreaking program came after months of community mobilization demanding more county jobs for people who have been impacted by the criminal justice system. At the Board of Supervisors regular Oct. 11 meeting, Alameda County Human Resource Services updated officials on the status of implementation for the program. According to the report, 50 entry-level job classifications currently exist that could be available for formerly incarcerated people. The presentation also included proposals on expanding job opportunities with the county for formerly incarcerated individuals, including eliminating the criminal history form and creating a pathway to entry-level jobs through a new job classification that signals to formerly incarcerated people that they are welcome as employees. According to the Human Resource Services presentation, from 2008-2015, 571 people received employment through the county’s ban the box efforts. Advocates believe this program will not only vastly improve long-term employment outcomes for Alameda County residents with arrests and convictions but also serve as a model for other counties throughout California as well as the country. “We applaud the Board of Supervisors for unanimously supporting the Re-Entry Employment Hiring Program, and today was a step in the right direction toward full implementation,” said John Jones III, a community advocate and life coach with Communities United for Restorative Justice for Youth, a member of the Justice Reinvestment Coalition. According to the timeline set by the Board of Supervisors, the Re-Entry Hiring Program will be implemented in January 2017 and will include job coaching and mentorship, court advocacy to assist program participants in reducing their probation terms, and training for County managers who will supervise participants in the program. Engage formerly incarcerated as partners in implementing the program, and recognize their skills and abilities as assets to workforce. Establish a clear and transparent timeline for implementation of the Re-Entry Hiring program by establishing clear goals, evaluating outcomes, and updating policies and practices as the county learns from past actions. And create a fair-chance culture so that formerly incarcerated people will thrive in their jobs by revising job announcements and eliminating automatic disqualifications for people with records and adding inclusive and affirming language signaling openness to hiring formerly incarcerated people. In the San Francisco Bay Area, many businesses have already successfully hired people with records, including D & B Painting Co., Inc., and Give Something Back Office Supplies. A 2014 Fair Chance ordinance in San Francisco spurred the hiring of hundreds of people with records who have been shown to perform as well in their jobs as employees without records. Alameda County has provided national leadership on efforts to change how people with records are treated. In 2006, the County removed the question about arrest or conviction records from their hiring process. The Justice Reinvestment Coalition of Alameda County is composed of community-based and advocacy organizations committed to creating a fair and just public safety system based on effective practices that invest in our communities, our families and our people. A fair and sustainable system eliminates criminalization and acknowledges that detention and incarceration impoverish our communities and harm public safety. Reach them on Twitter at @JRCAlamedaCounty, and on their website, at http://www.jrcac.org. Bilen Mesfin Packwood, founder and principal of Change Consulting, LLC, can be reached by email at bilen@change-llc.com, on LinkedIn at bmesfin, on Twitter at @bmesfin, or by mail at 1999 Harrison St., Suite 1800, Oakland CA 94612. For job seekers there is good resume samples for freshers who want to get job in best institute. This potentially benefit from the reentry program.